Mini Coyote GPS speed camera detector features GSM/GPRS technology for real-time speed camera updates - no need to update via the Internet. Mini Coyote is powered via an internal rechargeable battery providing up to 10 hours of operation. 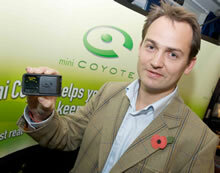 Mini Coyote warns of fixed and 'LIVE' mobile speed camera locations. 'LIVE' mobile camera locations can be reported and added to the database within 2-3 seconds. 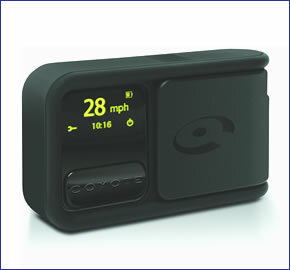 Mini Coyote has been designed to be plug and play and is pre-loaded with the latest speed camera database, ready to use. Mini Coyote also includes 3 months FREE speed camera database updates. Mini Coyote has been discontinued. Mini Coyote is 100% legal, state of the art speed camera detector. Combining GPS and GSM/GPRS technologies Mini Coyote alerts you to UK fixed and mobile camera locations via audio alerts and visual on screen information. Mini Coyote is powered by an internal rechargeable battery for wireless operation providing up to 10 hours of use. Mini Coyote is supplied pre-loaded with a comprehensive speed camera database updated, and is ready to use straight from the box. Mini Coyote provides information of fixed and 'LIVE' mobile speed camera positions. Mini Coyote tells you if you are approaching a 'LIVE' mobile speed camera another user has reported within the last three hours. You can also report any you see by simply pressing the main button on the unit. The information is broadcast to other Mini Coyote users within 2-3 seconds. On approach to a fixed speed camera location or 'LIVE' mobile speed camera, the Mini Coyote screen displays: the type of speed camera, the speed limit, your vehicles exact speed and the distance to the speed camera. For a 'LIVE' mobile speed camera: the time when it was last reported and for possible mobile cameras: the frequency of observation according to the colour code. green - less frequent, orange - frequent and red - very frequent. Mini Coyote, is for you and thanks to you. Its growing UK/European community are bound by the same values of information sharing and a preference for problem-free journeys. Every user has the opportunity to communicate the position of 'LIVE' mobile speed cameras. With Mini Coyote, you are never alone facing the dangers of the road. Contrary to other systems available on the market, Mini Coyote does not inform you of areas statistically at risk but of the actual presence of real dangers on the road. Equipped with both GPS and GPRS technologies, Mini Coyote communicates regularly with our servers and informs you of relevant information during your trips. Information delivered by Mini Coyote is either obtained from our existing Mini Coyote users on the road or from the speed camera and speed limit information from the databases of our Partners. It is updated as soon as you turn on the device and the communication stays active throughout your trip so you can receive alerts at any time. A small black box, a button to inform us and a screen and a buzzer to inform you - that is all. Mini Coyote is so simple to use that users stay concentrated on their driving. This is the way Coyote Systems design their products and services : advanced technology that is very simple to use. British professional racing driver Ben Collins has worked as a stunt consultant and driver on a number of popular TV programmes and films, including the new James Bond film Quantum of Solace and Top Gear. "Speed and safety are essential elements of my work as a racing driver" he says. "But when I am on the public roads I am just like any other member of the public, keen to keep my family and my licence safe." "The Mini Coyote is brilliant because it provides up to-the-minute information on fixed and mobile speed cameras and a wide range of features to encourage safer driving and better fuel economy". Mini Coyote is easy to install, taking seconds to install and remove from your vehicle. The Mini Coyote can be either installed via the windscreen support, direct to your vehicles windscreen. Alternatively Mini Coyote can be installed on your dashboard via the supplied magnetic mount, then simply connect the car power lead and your ready to use your Mini Coyote. Mini Coyote speed camera database updates are free for the first 3 months.